Lotus root is the magic vegetable I love the most. It is harvested in autumn traditionally but can be bought all the year. 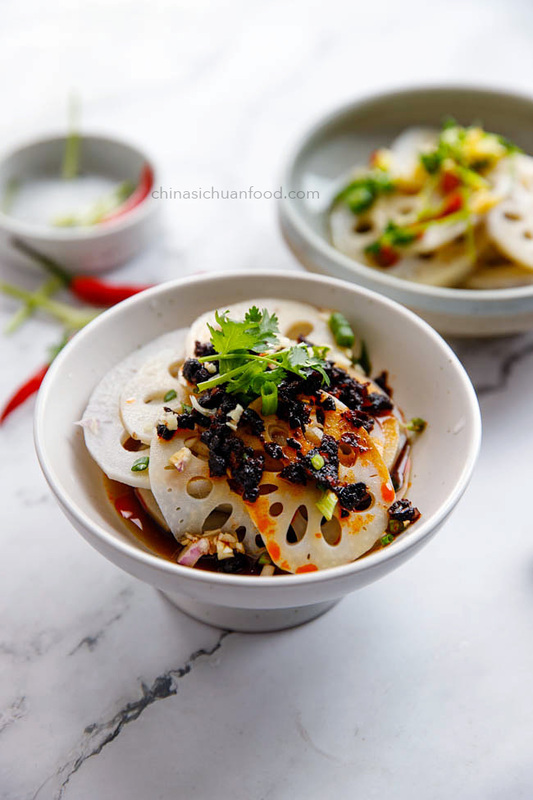 Traditional Chinese Medicine believe that lotus root is beneficial to stomach and lung, helpful for cooling down the body and controlling weight. The young girls love to drink lotus leaf tea or eat lotus root paste with the purpose of keeping fit. 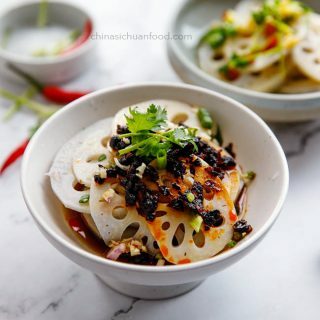 I recommend two ways of making yummy lotus root salad. Lotus root “莲藕” is a very popular ingredient in Chinese cuisine, all cross the country. 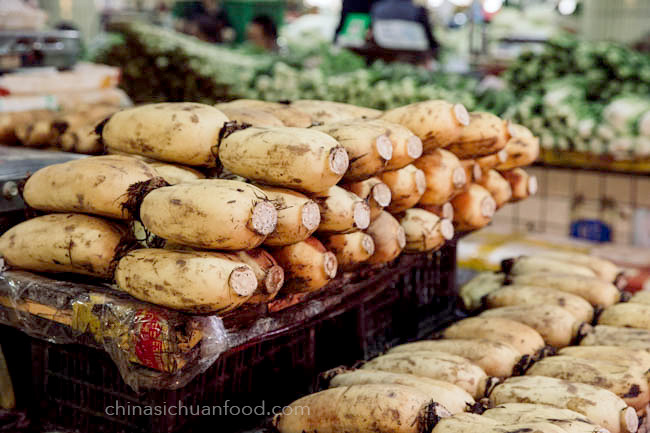 It is the rhizome of the lotus plant, a magic vegetable with beautiful appearances. The lotus plant is grown in mud but it give use very treasure lotus root, lotus seeds and beautiful lotus flower. 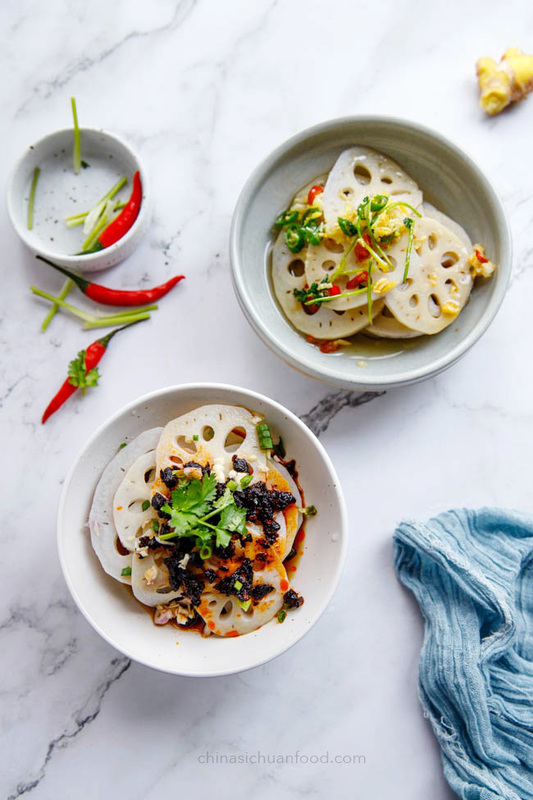 Lotus root has win the popular as a vegetable on the table. Louts seeds, wither eat freshly or dried to make dried louts seeds, which can be further used to make lotus root paste. It may have several small tubes adjacent to each other. For the convenience of transportation, the small tubes are broken to form two or three tubes together. 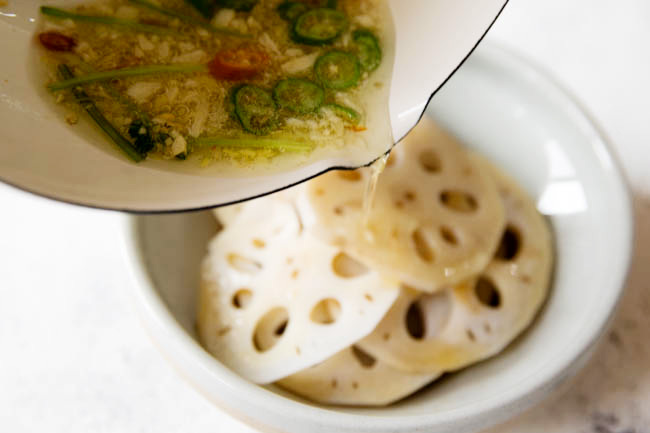 In cold winter days, lotus root is a perfect ingredient for soups (lotus root and rib soup) And in summer days, it is the ideal ingredient for salads. Remove the joining part, peel the lotus root and then thinly sliced. Wash the slices under running water to remove the extra starch. This step can make the slices crunchier. In a large pot with enough water, add 1/2 tsp rice vinegar or lemon juice. 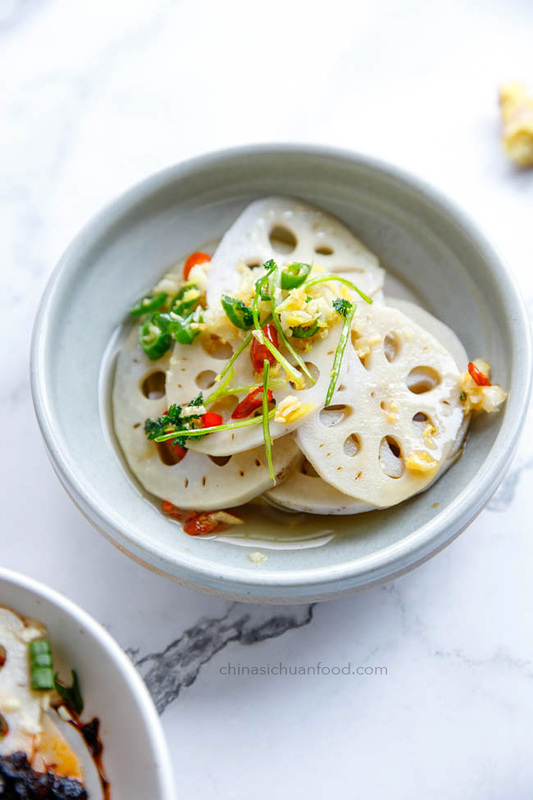 Soak lotus root slices for 10 minutes. 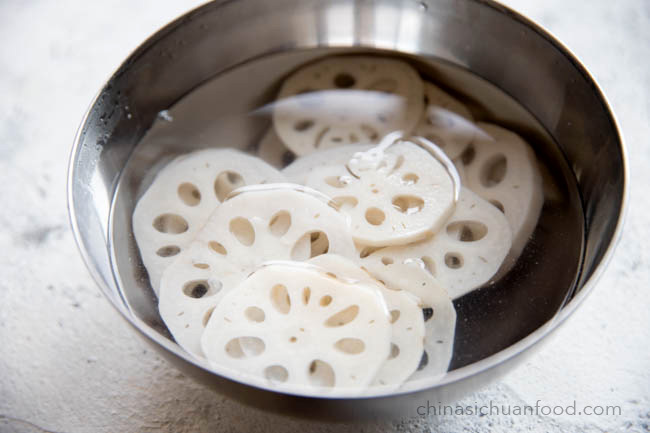 Bring a large pot of water to a boiling and then blanch lotus root slices for 1 minutes. Transfer out and soak the slices in chilled water until completely cooled. Drain. Drizzle light soy sauce, sugar, vinegar on the slices. 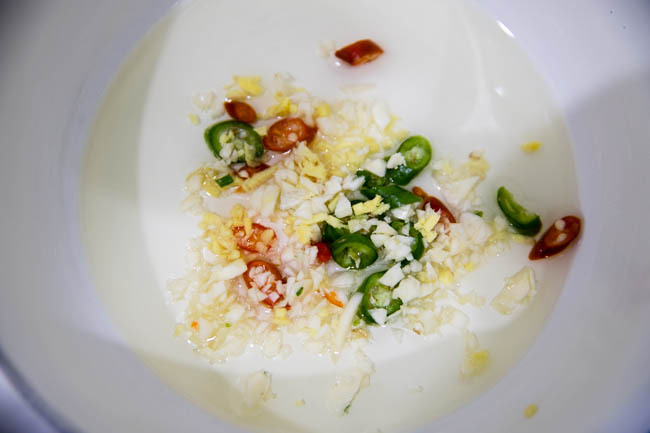 Heat vegetable oil in a small pot, add peppers, garlic and ginger in. Heat over medium to slow fire until aromatic. Add coriander stem in and continue cooking for 10 seconds. Pour the oil over the slices. Mix well and enjoy. Add all the other seasonings in the serving plate and serve directly. For this special hot version, you can use Lao Gan Ma crispy chili oil or homemade Chinese red oil. However the later one contains no salt, so if you use Chinese red oil as a substitute, add a small pinch of salt in addition. 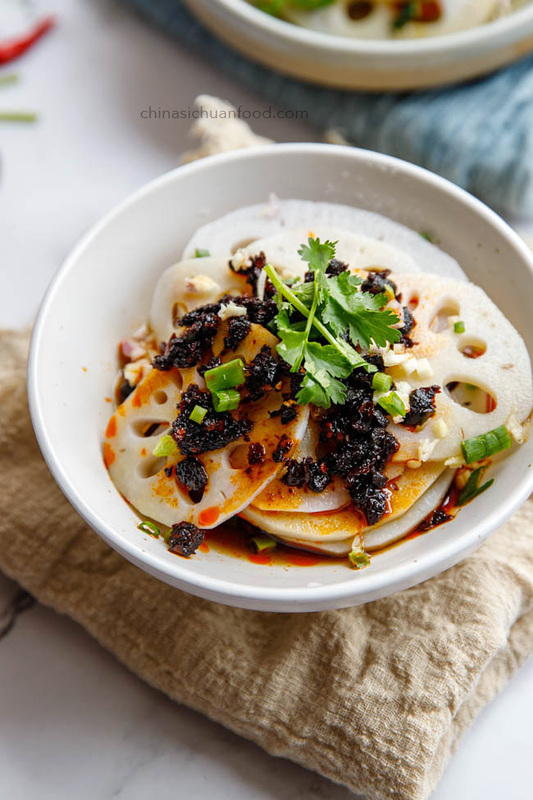 Quick and easy lotus root salad for warmer days. Add all the other seasonings in the serving plate and serve directly.